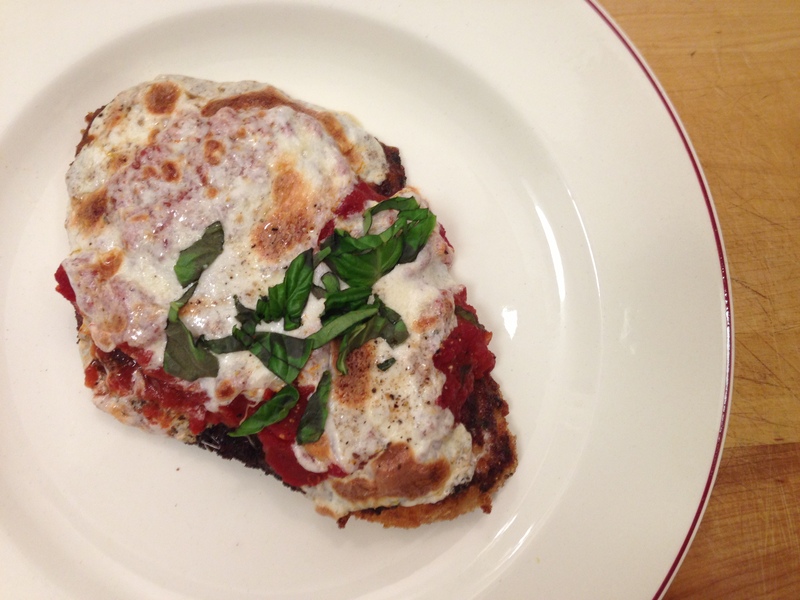 Chicken parm is a dish that would often come to my mind whenever my mom would ask me, “What would you like for dinner tonight?” before I headed out the door to school. And then I would arrive home, wait by the window for her little red Saab to roll up the hill and into the driveway. I would proceed to follow her into the kitchen so I could watch her pound the thawed chicken on the counter while still wearing her high heels. “It’s so easy,” she would say as I watched her dredge the chicken through the flour and egg and then finally through the bread crumbs. It was easy, but it never tasted like it was easy to make. 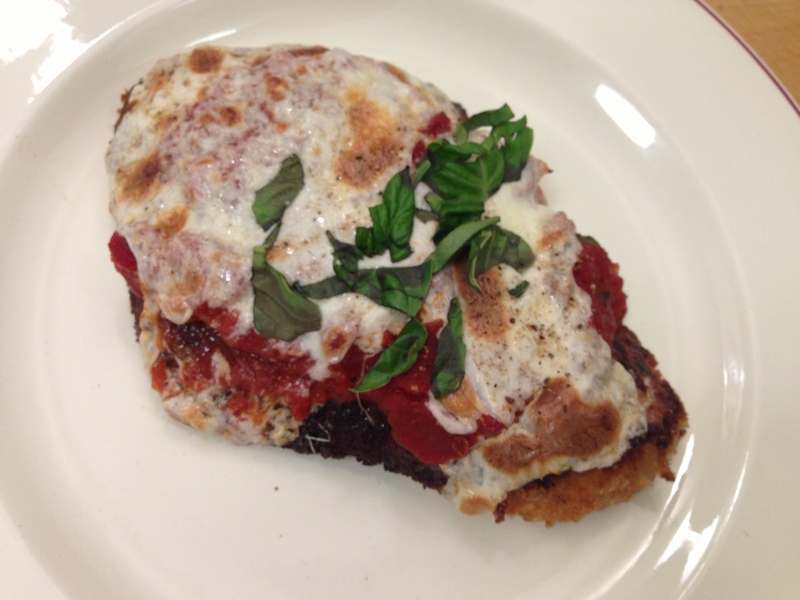 Those are the kinds of dishes that Fieldhouse Kitchen is all about. I’m a less is more kind of girl. This recipe is as simple as can be, involves a few shortcuts so it’ll save you time, and if my mom can make it after coming home from work after a long day and standing in the kitchen in her high heels, so can you. Begin by preheating the oven to 350 degrees. 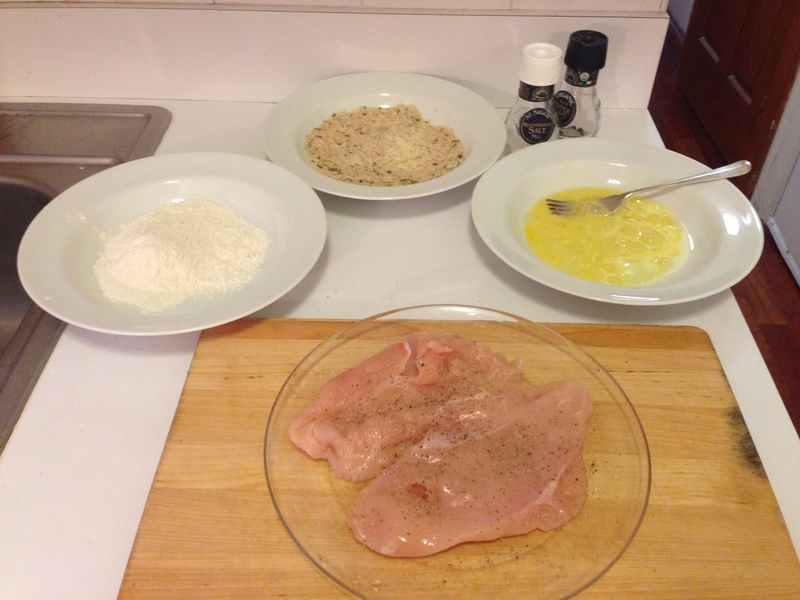 Wash the chicken breasts and dry them with a paper towel. Pound the chicken however you like. 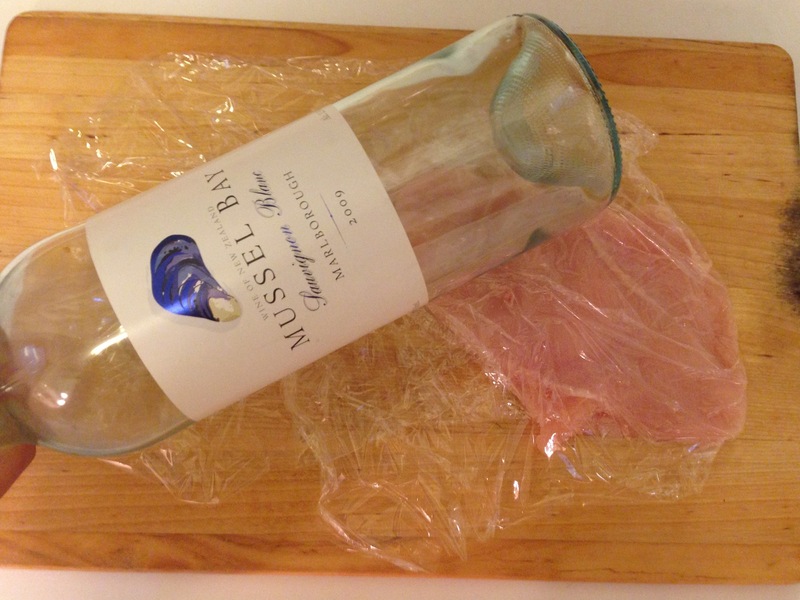 I use an empty wine bottle. 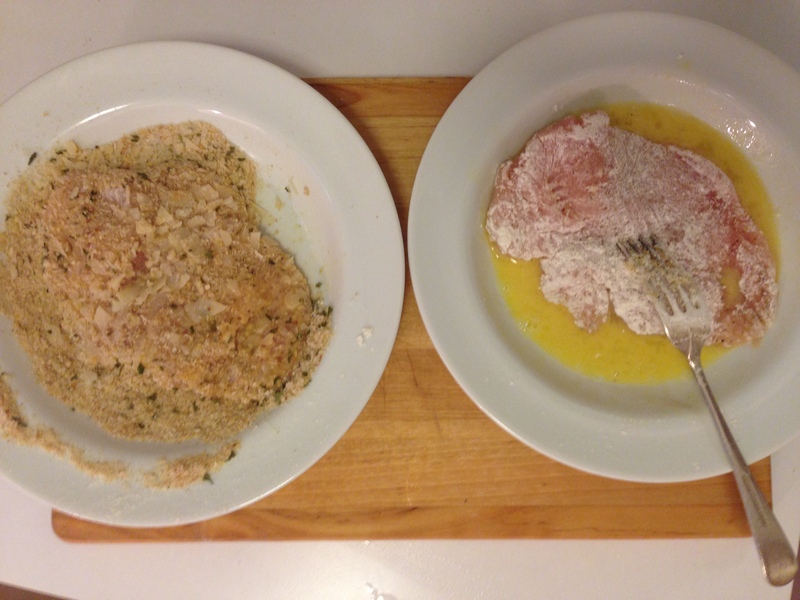 Season the breasts on both sides with salt and pepper. Now set up three bowls. One for the egg, one for the flour, and one for the breadcrumbs. 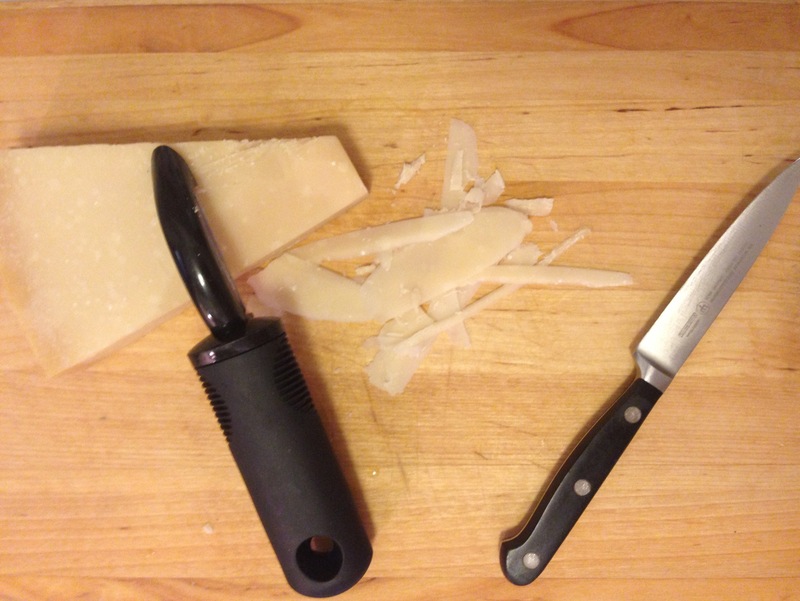 Grate or finely dice the Parmigiano and add it to the bowl of bread crumbs. 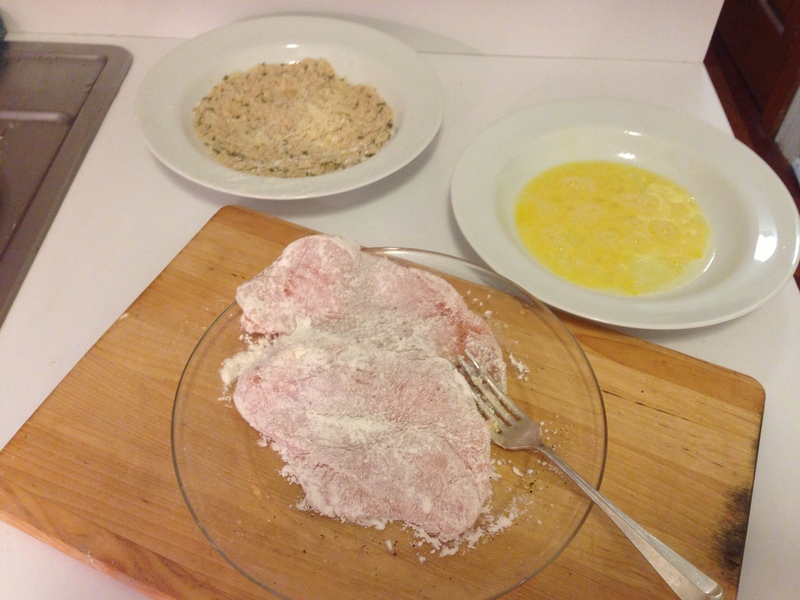 Lightly dredge the chicken breasts in flour, shake off the excess, and coat them in the egg wash, then finally in the bread crumb/Parmigiano mixture. 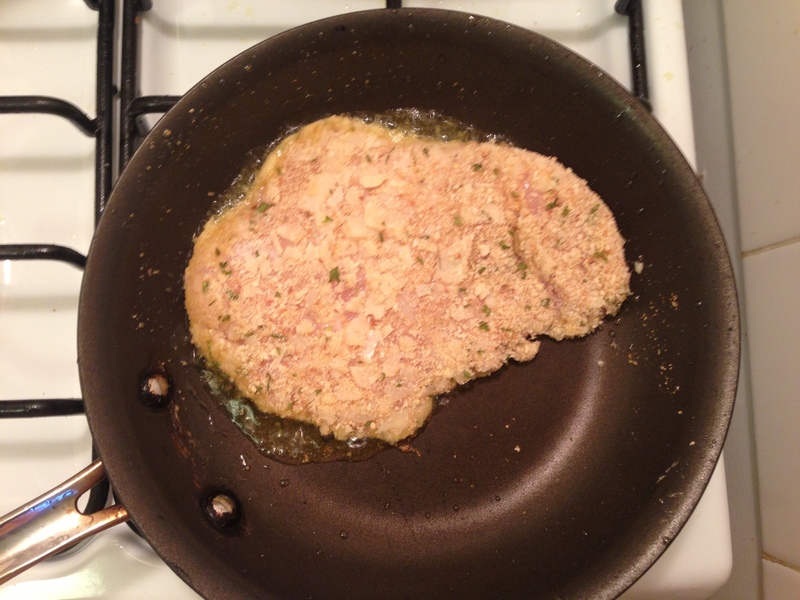 Heat your frying pan with 2 tablespoons of olive oil per breast. Make sure the oil is hot before you add your chicken or you won’t get a nice brown crust. 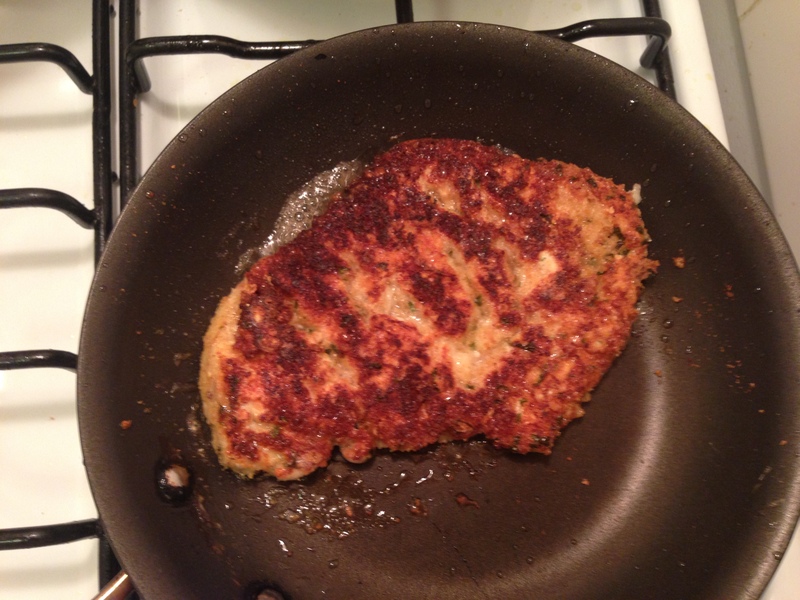 I fried my chicken one at a time (small pan). 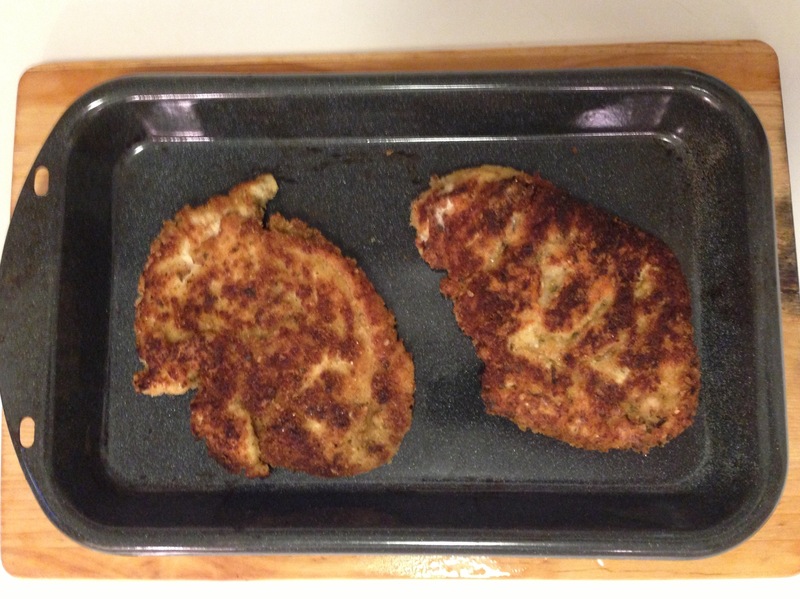 Fry the chicken about 3-4 minutes per side, or until golden brown. 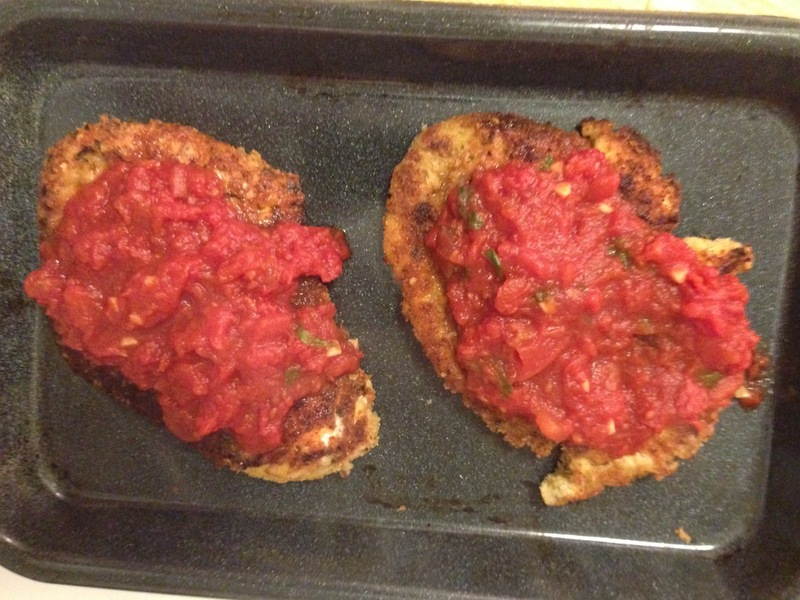 Remove the chicken and place them onto a baking dish. When it comes to sauce, I’m a bit of a purist. I like simple flavors. I pour a tablespoon of olive oil into a small pan and let it heat up. I finely mince a clove of garlic and let it infuse the olive oil for about a minute — careful because garlic does burn easily! 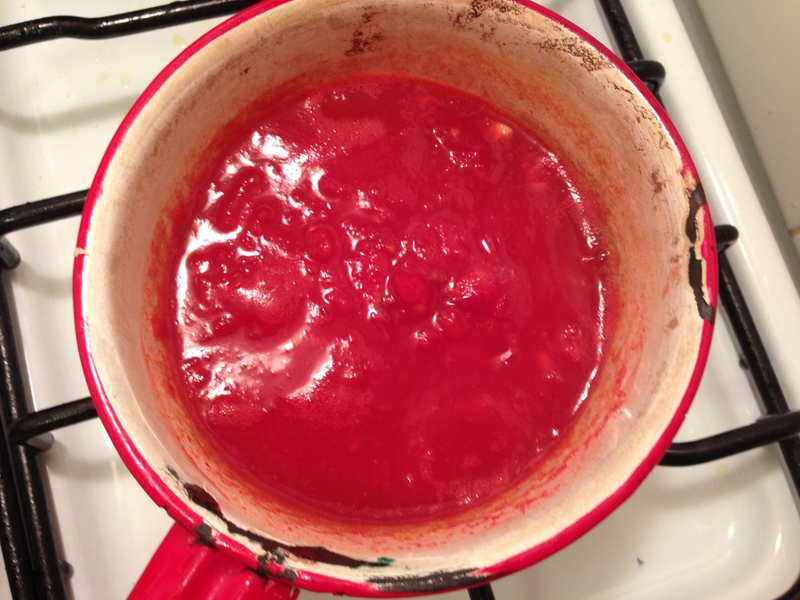 I then pour in the chopped tomatoes and let it simmer and reduce for about 15 minutes. I’ll add the basil at the end and stir gently, then remove from the heat. 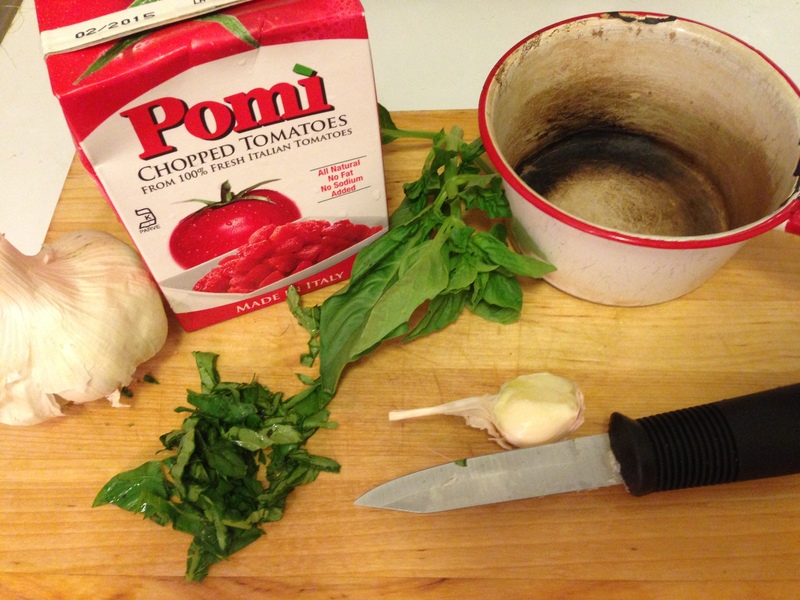 You could always make your own sauce or use your favorite jarred sauce. I just opt for as simple as possible seeing as the bread crumbs are already seasoned. 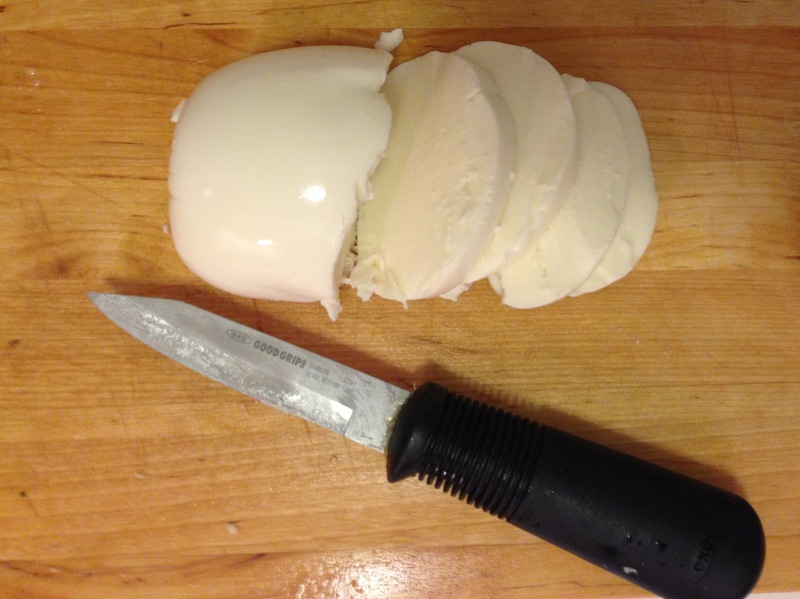 Meanwhile, cut 4 thick slices of mozzarella. 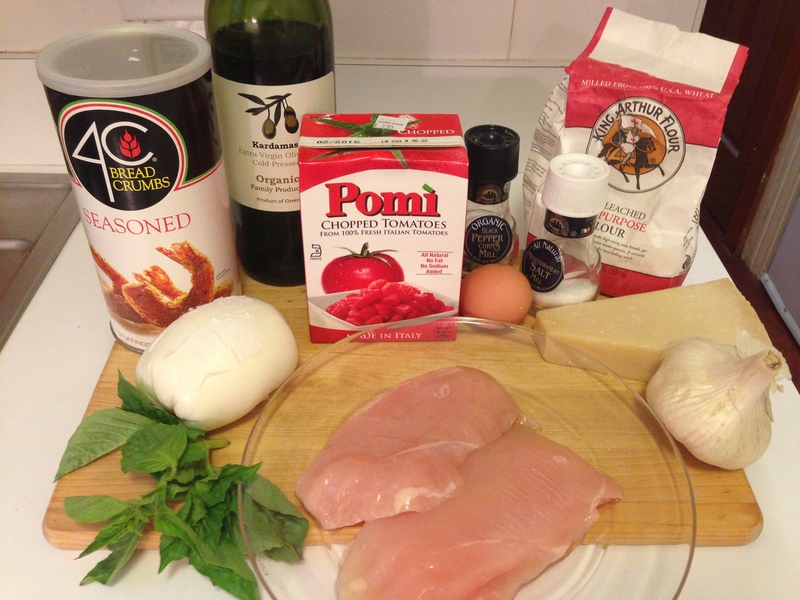 Top the chicken with the sauce and mozzarella. Place the chicken into the oven for about 20 minutes, or until the cheese is melted and bubbling. 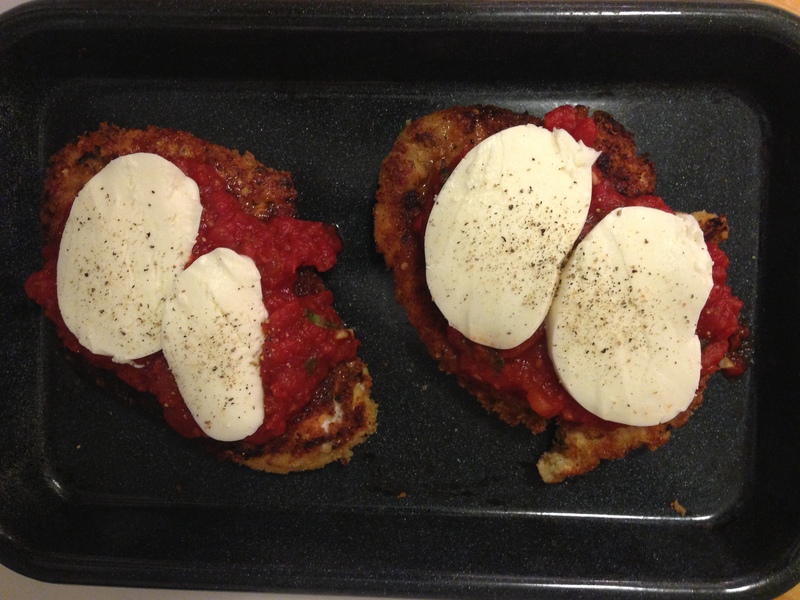 I tend to throw mine under the broiler for about 3-4 minutes after so that the cheese gets slightly toasted. Now time for plating. 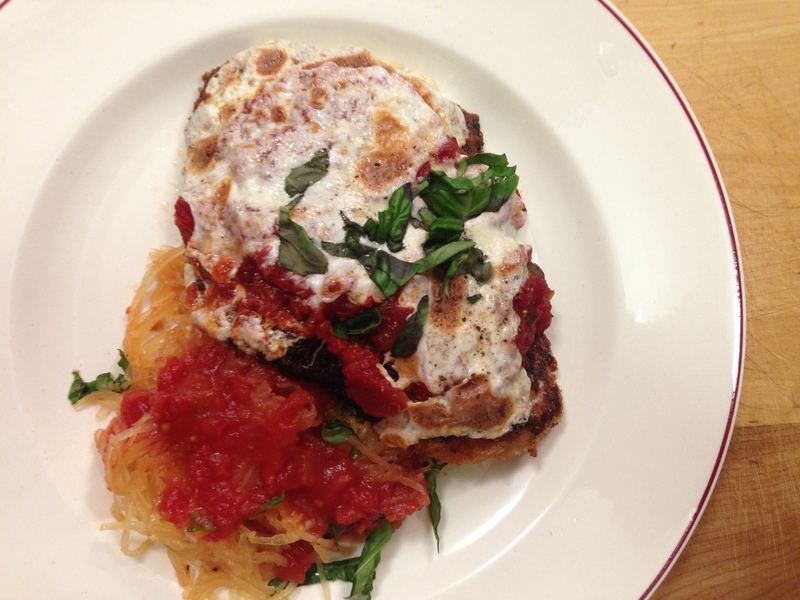 Serve alongside pasta, or spaghetti squash for a healthier alternative. And don’t forget the red wine! Fieldhouse Fun Fact: When I was growing up, this was a popular meal that my family and I ate around the dinner table on fall and winter nights. My parents would be drinking red wine and discussing important issues. My sister would be eating and half-listening. And I would be quietly feeding my cat pieces of chicken under the table. He loved my mom’s chicken parm as much as I do!